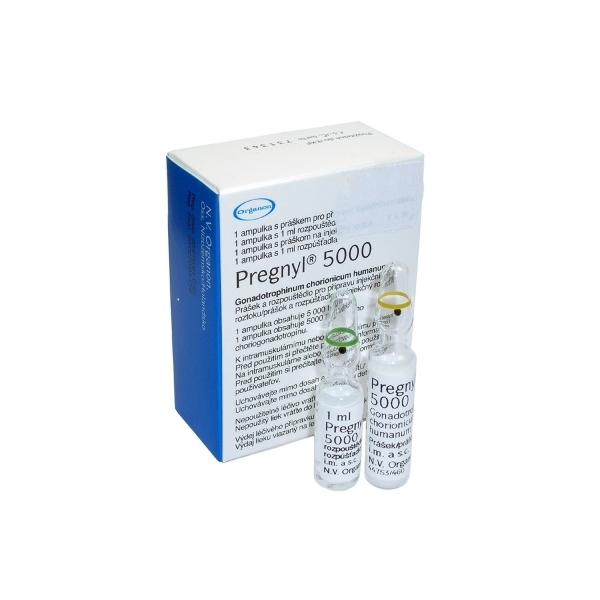 Pregnyl 5000 is a hormonal drug that is designed for testosterone production at male athletes and for estrogen and progesterone synthesis stimulation after ovulation at female athletes. Pregnyl may be purchased in the form of powder in order to prepare the injections. The powder is placed in ampoules if 1500 and 5000 ME. The set includes a solvent for injection preparation. The set contains one ampoule (lyophilisation + solvent). The preparation is injected intramuscularly. The prepared solution cannot be stored. Dosages are appointed individually by the treating doctor, depending on many factors and the expected reaction to Pregnyl administration.